Triad Pro Innovators, Inc. (“Triad Pro” or “The Company”) is a diversified energy company. Triad Pro Innovators specialty is “green,” renewable energy battery storage systems and applications. The Triad Pro eCell technology is a solid state energy storage system solution, free of highly toxic and explosive materials such as lithium and lead. The Triad Pro eCell can also be fully charged significantly faster than a lithium or lead based battery. The Triad Pro eCell accepts 100 percent of its capacity very quickly because the charging process is only limited by the network that is feeding it, and not our technology. Our technology provides a “set-it-forget-it” environment for all users and applications. The advanced technology of the Triad Pro eCell was designed with a focus on safety, eco-friendliness, minimum maintenance and longevity. We can confidently say the Triad Pro eCell is non-combustible, 100% Recyclable and requires zero or low maintenance when properly installed. It can exceed 1,000,000 + charge/discharge capability, providing longevity unparalleled in the renewable energy storage sector. The key to our technology advancements is driven by how we capture and store energy, and how we design efficiencies to expend the energy. Triad Pro Innovators is primarily engaged in developing these technologies. Applications of our innovative energy storage and motor efficiency solutions for the light electrical vehicle market are the main focus of the company. 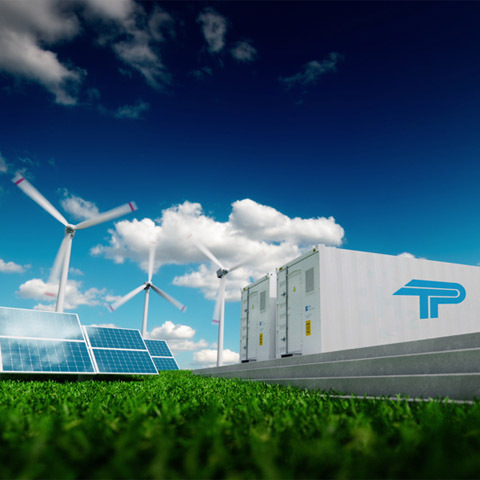 The Triad Pro eCell technology offers energy storage solutions, scalable for all sizes, ranging from transportation to industrial off-grid electrical applications. Global demand for renewable battery storage is at an all-time high and emerging rapidly. Certain industries such as farming, mining, oil production and military currently rely on diesel-generated electricity, because they are located in areas where standard grid electricity is unavailable. Triad Pro eCells can offer a viable solution for standalone products when partnered with solar acting as the main charge. At Triad Pro Innovators, our staff consists of highly trained engineers in the development center. These engineers have a depth of experience in the design, assembly, prototyping, testing, and field installation functions required to support our existing products, as well as develop our new product in the pipeline. We also have well trained sales, management, and administrative support staff in the office, most of whom have years of experience in the energy business. Triad Pro is a publicly traded company. The company plans to continue to grow through acquisitions, research and development. One of the most misunderstood components of a solar powered system is the battery. Solar battery banks may contain heavy lead acid, lithium ion or nickel metal hydride batteries that all have issues, such as weight and temperature restrictions, as well as a limited life of charge – discharge cycles. Batteries are designed for specific types of charge and discharge cycles. A solar battery must be able to provide long periods of deep discharge at night followed by a full recharge in only a few hours of sunlight. Very few batteries can take a daily deep discharge-recharge cycle. When the sun is obscured by weather, charging stops and restarts again, creating a reversal in the chemistry. The incremental cycle count wears on the battery. SOLAR NEEDS A BETTER BATTERY SOLUTION. If you simply connect your solar panels directly to the battery, you may over charge it and it could explode. For example a 12 volt solar panel can produce over 25 volts in direct sunlight. In addition, when a battery reaches full charge, the charging current needs to be turned off or reduced to a trickle to protect the battery from an over volt condition. The Triad Pro eCell has built in circuitry to prevent over voltage or thermal run away conditions. TRIADPRO eCELL IS THE SOLUTION. The success of the Triad Pro solid state storage solution makes renewable energy better by storing electricity instantly. Warranted for 10 years and rated for over 1,000,000 charge and discharge cycles, the Triad Pro eCell reduces the headache of routine, monthly maintenance and battery replacement every 3-5 years. Triad Pro eCells makes solar energy storage greener & better. A solar panel will last approximately 20-30 years … Shouldn’t the battery? Worldwide pressure is compounding yearly for renewable, “green” energy storage from government, municipalities and large corporations. Bloomberg New Energy Finance predicts that in the next 12 years, energy storage will mirror solar’s growth between 2010 and 2015, which was 700 percent. Energy storage had a very good year in 2017. 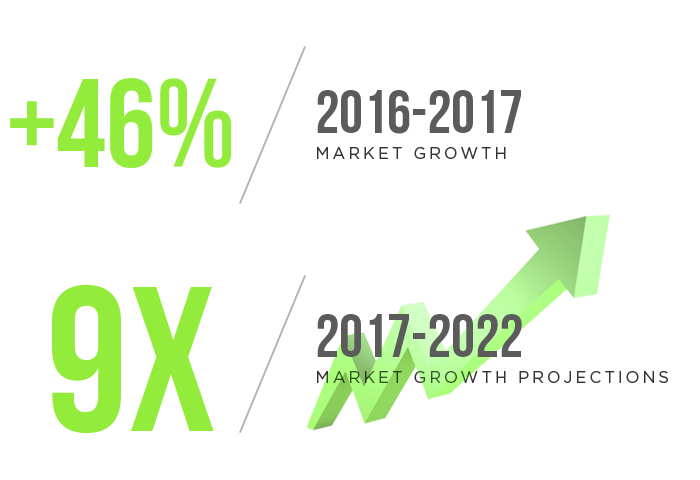 Not only did the market grow 46 percent from 2016 to 2017, but the industry is projected to grow nine times in size between 2017 and 2022. ENERGY STORAGE MARKET BOOMS, WITH MORE GROWTH TO COME. Employment is booming as well. From 2015 to 2016, energy storage jobs increased 235 percent to reach 90,800 jobs, with battery storage accounting for over half. By 2022, deployments are projected to increase 859 percent. This is some amazing growth, coming from almost nowhere just two to three years ago. Off-grid solar makes possible a wide range of applications and continues on a path of rapid growth. Today, off-grid applications ranging from private residences and eco-resorts to remote lighting, telecom and community microgrids in developing countries, benefit from battery storage solutions. Opportunities for growth in the off-grid energy storage market are found in both developing and developed regions of the world. 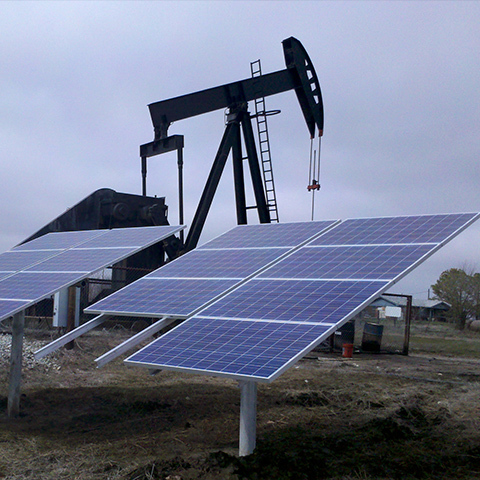 Let’s take the oil and gas industry, which has seen the pairing of two unlikely industries: solar and big oil. 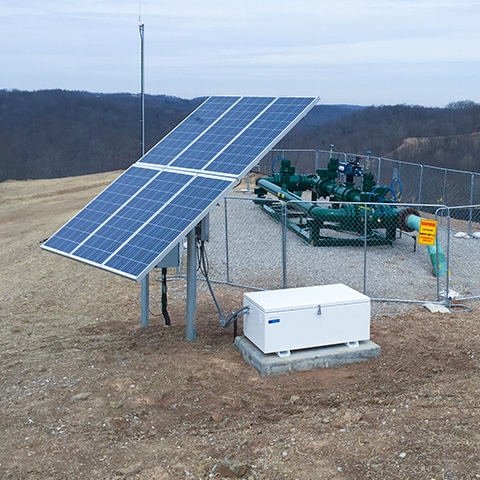 In recent years, oil companies have relied on solar power with battery storage to operate remote well pumps in some of the harshest environments throughout the world to avoid costly downtime. Solar power is displacing previous power methods such as diesel generators and pneumatic pumps, which have both economic and environmental repercussions. The use of renewable energy sources such as solar and wind with battery storage are now in place to operate many of these remote oil production sites. In developing regions, Bloomberg estimates that 1.2 billion people worldwide still do not have daily access to reliable electricity. This has led to the increase in installations of off-grid microgrids in these remote areas. In Colombia, the government, through its Ministry of Mines and Energy, issued a mandate to expand the availability of electricity to the country’s northern remote Choco region bordering Panama along the Caribbean Sea. The project involved building solar microgrids to provide power for five indigenous communities. Having reliable electricity available for most of the day enables these villages to expand and improve the quality of life of residents, as well as enhance commercial business activities, which benefits the country as a whole. 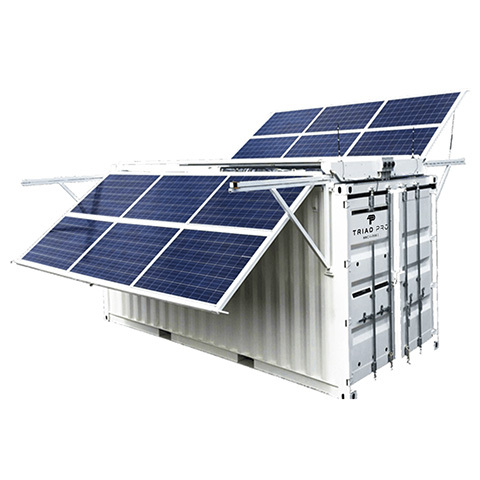 As the global community continues to adopt off-grid solar, the implementation of energy storage solutions is sure to mirror the fast-paced growth of this off-grid energy segment. The Triad Pro eCells proven energy storage technology is capable of providing an energy storage solution for applications normally reliant on highly toxic, short-life lead acid or lithium-ion batteries that have the potential to combust when overcharged. With the success of the Triad Pro eCell, chemical battery power loss and other design limitations, such as overheating and short product life cycles, are eliminated. Triad Pro helps make renewable energy greener, safer and more efficient by allowing applications to utilize more of the renewable energy generated, anytime, day or night, using the Triad Pro eCell system. Feel free to contact us at 714.790.9499 or info@triadproinc.com. Are you a TPII shareholder? 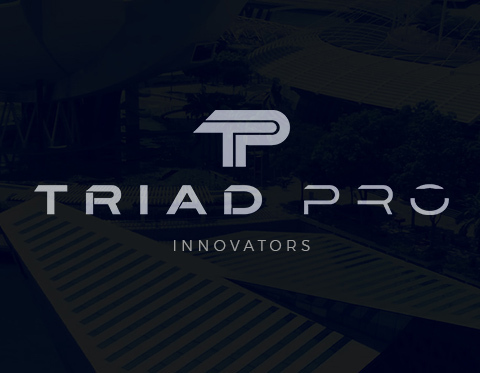 This website is provided as a convenience to Triad Pro® Innovators, Inc.. (“TPII”) shareholders and the public. The statements and communications contained in the TPII website are intended for information only. None of them constitutes a solicitation, an offer or a recommendation to buy or sell securities, or to conduct other transactions. No warranty, either express, or implied, is given for the information and opinions published on the TPII web site. Actions based on statements made therein are the responsibility of those who take them. TPII therefore disclaims all liability for damage which may result directly and indirectly from the use, performance or consultation of the TPII web site, in connection with access to the website itself or other websites linked to it. This website contains certain “forward-looking statements.” Such forward-looking statements are sometimes identified by words such as “intends,” “anticipates,” “believes,” “expects” and “hopes” and include, without limitation, statements regarding TPII plan of business operations, potential contractual arrangements, receipt of working capital, anticipated revenues and related expenditures and involve a number of risks and uncertainties that could cause actual results to differ materially from projected results. Such factors include, among others, the willingness and ability of third parties to honor their contractual obligations, the decisions of third parties over which TPII has no control, commodity prices, environmental and government regulations, availability of financing, judicial proceedings, force majeure events, and other such risk factors. Many of these factors are beyond TPII’s ability to control or predict. Investors are cautioned not to put undue reliance on forward-looking statements. Except as otherwise required by applicable securities statutes or regulations, TPII disclaims any intent or obligation to update publicly these forward looking statements, whether as a result of new information, future events or otherwise. the use of or reliance on information contained in this website; any inaccuracy or omission in such information or failure to keep the information current; use of any third party websites linked to this website; any Internet software used in connection with this website or computer viruses or other destructive programs encountered as a result of using this website; and any other matter connected with this website; even if TPII is made aware of the possibility of such claims, expenses, damages or losses. Due to technical difficulties inherent in the Internet, Internet software or transmission problems could produce inaccurate or incomplete copies of information contained on this website. Computer viruses or other destructive programs may also be inadvertently downloaded from the website. TPII shall not be liable for Internet software, computer viruses or destructive programs and recommends that you install appropriate anti-virus or other protective software. TPII provides links to third party websites for your convenience only and the inclusion of these links does not imply that TPII monitors or endorses these websites. Accordingly, TPII accepts no responsibility for such websites. This website is not intended as a solicitation or offering of securities in any jurisdiction and the information contained herein in no way should be construed or interpreted as such. No securities commission or other regulatory authority in the United States, Canada or any other country or jurisdiction has in any way passed upon this information and no representation or warranty is made by TPII to that effect. The information on this website should not be used for the purpose of making investment decisions concerning TPII securities. Printed copies of public disclosure documents may be obtained directly from TPII Investor Relations..
All quotes are delayed at least  minutes unless otherwise stated. All stock quotes and historical stock price data are provided by third party service providers and are provided for informational purposes only, and are not intended for trading purposes. If you are contemplating trading in the securities of TPII we strongly advise you to seek independent professional advice before making any investment decision. TPII makes no representation or warranty regarding the accuracy or completeness of any such stock price quotes or historical stock price data and has not taken any steps to verify the adequacy, accuracy or completeness of the information provided herein. TPII, its affiliates and third party providers are not responsible for any errors or omissions in the information contained on or accessed through this Site. All such information in this Site is provided “as is”. TPII, its affiliates and third party providers make no warranties or representations and disclaim all express, implied and statutory warranties of any kind to the user and any third party, including, but not limited to, any warranties of accuracy, timeliness, completeness, merchantability, non-infringement and fitness for any particular purpose. Except for claims that cannot be excluded by the applicable local law, TPII, its affiliates and third party providers shall not have any liability, including but not limited to, tort, contract or any other liability to user or any third party arising as a result of use of or access to this Site. TPII, its affiliates or third party providers shall not be liable to user or any third party for lost profits or lost opportunity, direct, indirect, special, consequential, incidental or punitive damages whatsoever, even if TPII, its affiliates or third party providers have been advised of the possibility of such damages. Some jurisdictions do not allow for the exclusion or limitation of implied warranties or liability for incidental or consequential damages. Therefore, the above limitations may not apply to you, or there may be applicable laws which supersede the above. Any clause of this disclaimer declared invalid by the appropriate authority in each jurisdiction shall be deemed severable and shall not affect the validity or enforceability of the remainder of this disclaimer. TPII reserves the right to amend the document at its discretion at any time without notice. We collect and store information about you when you use our website. This information includes, but is not limited to, your name and e-mail address if you contact us through the TPII website, as well as keeping a record of the pages you visit on our website or other websites we connect to. We use this information to analyze and improve our website. In order to protect information that we collect from unauthorized access, copying, use, modification or disclosure, we use various security measures, including, but not limited to, Secure Socket Layer (SSL) encryption technology. Like many other service providers, our website uses “cookies”. Cookies are files stored on your computer or mobile device to help us to identify our users and to optimize your internet experience with us. We contract with third parties to provide services in connection with the operation and information offered on our website as well as other areas of our business. We provide limited user information to these third parties, and authorize them to only use this information in connection with the services they perform for TPII. We may release provided information as the law or legal process requires, or such as is necessary to protect the rights, property or safety of TPII, or any of our respective affiliates, business partners, customers or others. We comply with all applicable privacy laws and regulations. We may periodically provide our users with promotions provided to us by our Vendor Partners. These promotions will be sent in the form of an email message. Users have the opportunity to “opt out” of receiving these promotions at any time. The transmission of data or information (including communications by e-mail) over the internet is not secure and is always subject to possible loss, interception or modification. We, therefore, do not assume any liability for any damages you may experience or costs you may incur as a result of any transmissions over the internet. If you wish to review, verify or correct your personal information, please contact TPII by the general inquiries page of our website. We will respond to your written request within thirty (30) days. Acceptable proof of identification may be required before responding to such a request. We may charge you a fee to access your personal information; however, we will advise you of any fee in advance. If you have any questions, comments, or concerns about this policy or how we manage your information, please contact TPII. Distributed generation is an energy production technique which employs small-scale technologies (e.g. solar panels, wind or other generators) to produce greener or renewable electricity on-site. Triad Pro’s small-scale, localized, distributed generators provide lower cost electricity and higher power reliability compared to their outdated counterparts. Our generators drive small power plants to provide energy onsite with little reliance on the distribution and transmission grid. Larger, centralized power plants often run on coal, oil, or nuclear power, and are frequently located far from the end users. This means longer transmission distances, greenhouse gas emissions, production of nuclear waste, and serious potential for power loss through transporting energy over long distances. 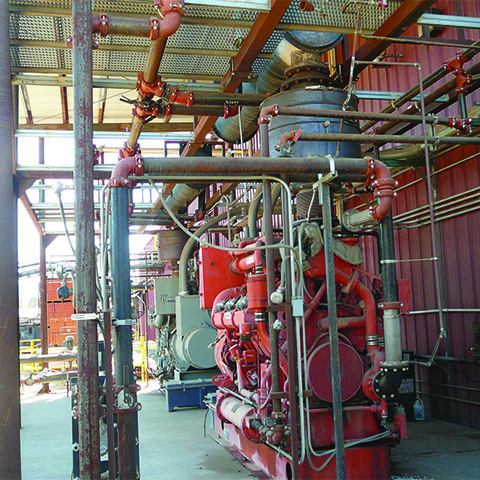 Triad Pro Innovators, in its Energy Production division, owns and operates distributed combined heat and power (CHP) energy projects that are fueled by clean-burning natural gas. 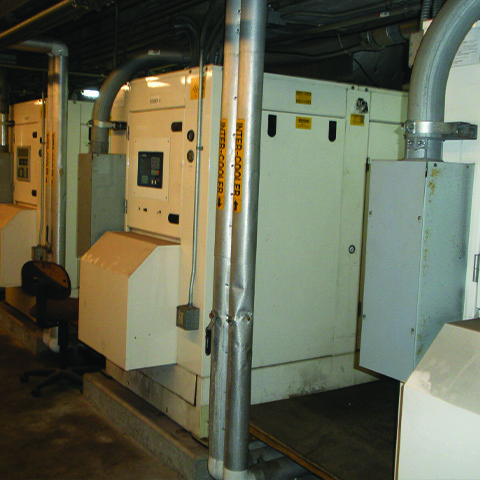 These units are located onsite at customers’ facilities and they produce electricity, as well as heat, and/or chilled water under long-term multi-year contracts. Co-generation makes two or three uses of a single burn of clean fuel, lowering emissions and increasing efficiency far beyond traditional power plants. The Company currently owns approximately 6 production units with a faceplate production capacity of 1.8 Megawatts (MW) at two separate industrial and commercial facilities in California. The systems are designed to produce up to 60% of a site’s peak load, displacing peak demand that would otherwise place stress on an already constrained grid system, and saving our clients Peak utility rates. The systems typically run 8-20 hours a day, 5 days per week.